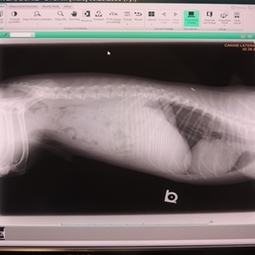 Radiography is a valuable diagnostic tool in veterinary medicine. As we continually strive to offer the highest quality medicine and diagnostic testing, we are pleased to offer digital radiology services as a means of providing fast results and excellent care to our patients. My pet ate what??? Radiographs are often taken when we suspect (or know) that your pet has eaten something -- like your good earrings!!! Things like metal and rock will show up very well on an x-ray, but other things (like socks and rubber) may not be seen at all. Radiographs are an important tool that can help us make a correct diagnosis for your pet. Our veterinarians may recommend a radiograph at the time of your pet's physical exam if there is something out of the ordinary discovered during the exam or if your pet is ill. In some cases, we may recommend sedation for your pet in order to get the best "picture" possible. Feel free to call our receptionists if you have questions or feel that your pet may need an x-ray.